Sometimes it’s better to share something, however humble, than to share nothing at all. 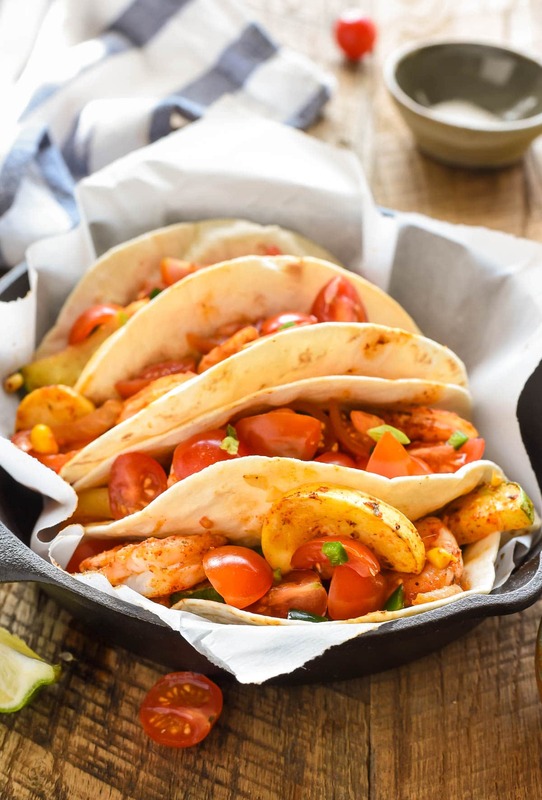 Today I’m sharing a recipe for these easy 30 minute Sheet Pan Shrimp Tacos and also sharing some thoughts on the events in Charlottesville. I don’t have easy answers, but today I share what I know–food and community–and hope it makes a difference. On the Saturday of the rally in Charlottesville, I scrolled through image after image of men wielding torches, spewing hate, and proudly brandishing swastikas, weapons, and Confederate flags. These were young men—many looked my age or even younger. Before I could even begin to feel angry, I felt baffled. How had these young men come to hate so much? Of course, after the confusion and disbelief came the sadness, the helplessness, the fear. I feared for our country. I feared for the people bravely standing in the path of destruction in Charlottesville. And I feared for what will happen in the coming weeks and months and years as our nation attempts to heal from yet another display of hatred and division. But fear, I realize, is what got us here in the first place. White supremacists, the KKK, neo-Nazis—I believe they all suffer from it. Behind all that hatred is fear. Fear of losing a deluded sense of superiority. Fear of losing control of their lives. Fear of people who look or believe differently than them. It’s terribly and dangerously misguided, but it’s fear nonetheless. That kind of fear can drive us to isolate, demanding we stay in our own echo chambers, never leaving the comfort of people who look and believe and live just like me. Fear keeps our front doors locked and our dinner tables empty. And in that isolation, fear is allowed to fester and grow, imprisoning us in a cycle of insecurity and prejudice, and eventually bubbling out into the kind of hate we saw on full display in Charlottesville. More often than not, I feel helpless when these things happen. It’s been two years ago since we talked and grieved over the events in Ferguson, MO, and it’s hard to say whether things have gotten better or worse. But I know giving in to fear and helplessness is not an option. So I’ll do all I know how to do. I’ll keep pursuing friendship with people who are different than me. I’ll keep having conversations with people who believe differently than me, even when it’s comfortable. When my son asks me about the many colors of skin he sees in this world, I’ll happily tell him that God made every person colorful and equal and beautiful. And someday, when the time comes, I won’t be afraid to tell my son about our country’s ugly history of slavery and racism, and I’ll celebrate with him the many men and women who have fought for justice and equality. I’ll keep making dinner and inviting people over to eat it with us. I want my family’s table to be as diverse as the world around us. I’ll keep coming back to the table as a safe place. I’ll keep using brownies to break the ice and macaroni and cheese to heal wounds and open doors to conversation. Maybe coming together isn’t as hard as it seems. Maybe it starts with Sheet Pan Shrimp Tacos and an invitation. Grab all those late summer veggies–the overflowing zucchini, the peppers, and the sweet corn. Throw them on a pan, sprinkle them with some smoky spices (and maybe some love and a prayer or two), then bake it up. Invite people to the table and listen. Listen as you pass the sour cream and avocado slices. Listen as you clink glasses and share how your week has been. Listen to the good stuff and the bad. Listen to the fears and anxieties and listen to the joys and hope. Make food and bring people together. This is all I know how to do, but it might just be enough. 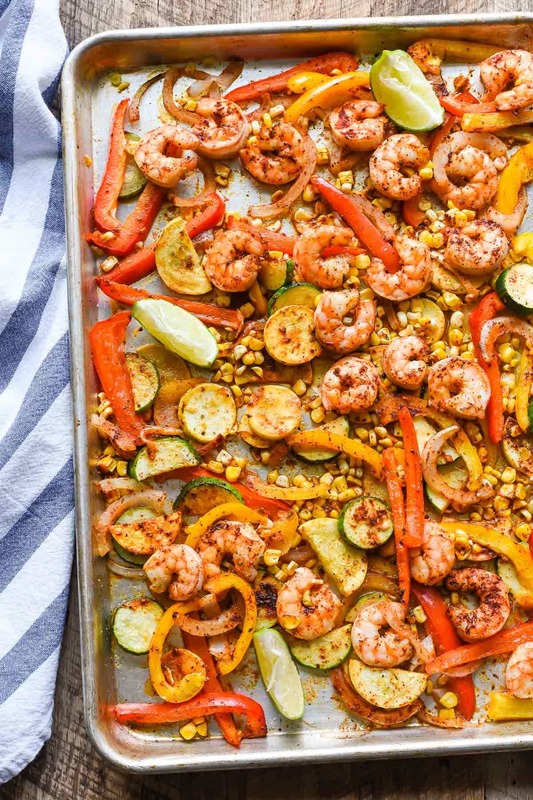 Make the most of all those late summer veggies with this 30 minute sheet pan shrimp taco recipe. Preheat the oven to 400 degrees. Line a large baking sheet with foil and spray with cooking spray. 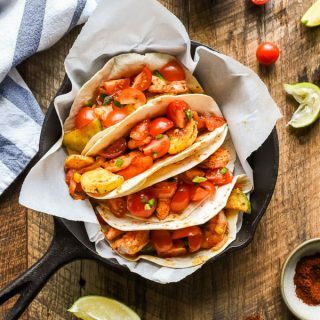 In a bowl, whisk together the chili powder, garlic powder, onion powder, oregano, smoked paprika, salt, and pepper. In a bowl, toss the squash, peppers, onion, corn and zucchini with half of the spice mixture and 2 Tablespoons of the olive oil. Spread the vegetables out evenly on the baking sheet. Bake for 12-13 minutes or until starting to soften. While the vegetables cook, toss the shrimp with the remaining spices and olive oil. 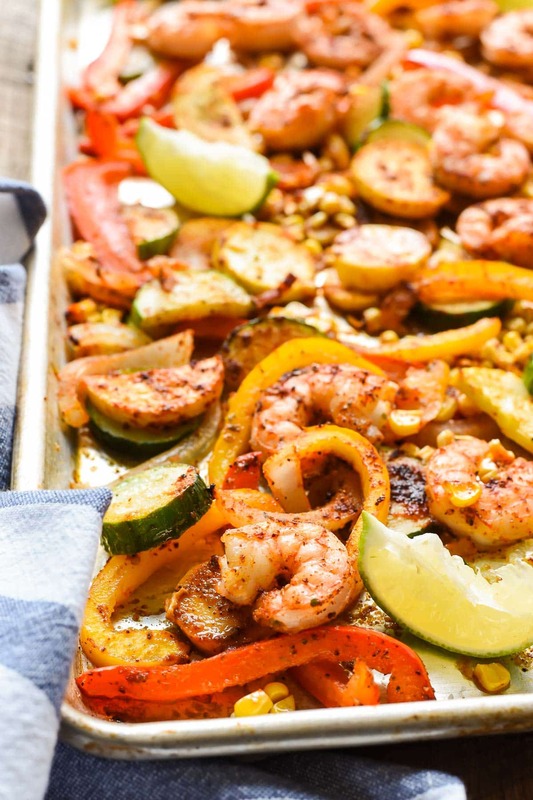 Remove the vegetables from the oven and spread the shrimp evenly over top. Continue to bake for another 6-8 minutes or until shrimp are pink. You can also place your tortillas, wrapped in foil, on the top rack to warm up during this time. Halve the cherry tomatoes and toss with the jalapeno and juice of 1 lime. 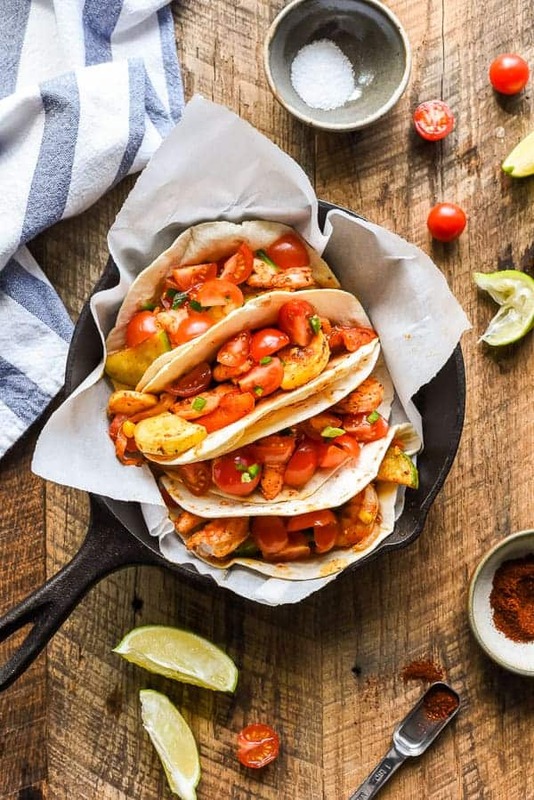 Serve the shrimp and vegetable filling in the warm tortillas with the cherry tomato mixture on top. Yum! I’ve been on a shrimp taco and grilled corn kick this week. Can’t wait to try these out. Ah! Grilled corn is everything! Hope you enjoy the tacos! what is the world coming to, I never knew that people could hate others so much. We need to get along and love one another. We need to set an example to others that there is more to life than hate. I agree with your comments, there should be love not hate. I agree too Gloria. I hope we can move toward the future you imagine. Hi! This looks wonderful! I’m a little unclear on when to add the shrimp. Do they go in at the same time as the vegetables? Sorry about that! The recipe is unclear! The Shrimp goes on in the beginning with all the other veggies.